Nasima is a resident of village GajariaPara of Sonargaon Upazila in Narayanganj district. It has been 30 years since she got married with Alek Miah, who is a day laborer. With such a meager income of Alek Miah, they could barely meet their daily necessities. They faced more economic hardship as their four children grew up and their needs multiplied by many folds. They had to married off their eldest daughter at an early age and before she could finish primary school education. In order to ease the economic burden she became a member of Pidim run SCG (Savings and Credit Group) named Shishir in her village and borrowed BDT 15 thousand for beef fattening. 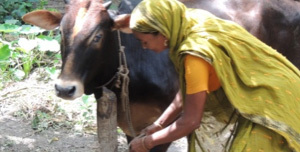 She fed the cow processed fodder and also got it vaccinated against deadly diseases with the help of program staff. She made quite good sum of profit from selling fattened cow. She took repeat seasonal loans and continued with the IGA. She recently took loan of BDT 20 thousand and purchased a male cow worth BDT 27.5 thousand for fattening. The remaining amount came from her own-savings fund. The present value of the cow is BDT 45 thousand. She will sell it in the coming Eid market. Her income brought relief to her husband. With their joint income they could somehow manage to finance education of their children. Their son got a job in nearby fabric factory after passing SSC examination. They married of their second daughter after she completed high school education. Their youngest son is now studying in Class-V. Nasima’s husband, Alek Mian changed his occupation and now earns his income from sharecropping. Both of them make regularly savings and they have a plan to set up a dairy farm and also rebuild their old house.